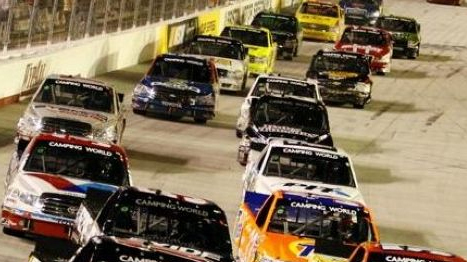 Kyle Busch and Kevin Harvick have won seven Camping World Truck events this season – and both are entered in the O’Reilly Auto Parts 200 at Bristol Motor Speedway Wednesday night – but Austin Dillon isn’t intimidated. The 21-year-old driver, who also has a win to his credit this season, is confident that he can leave the half-mile oval with a win, en route to what he hopes will be a championship. “There are a lot of great drivers in the Truck Series,” he said. “And a lot of them do very well at Bristol. But I feel like we’re going to do well, too. “It (Bristol) is a wild card because the track is so small that things happen there really quickly. You can get in trouble there and not even have time to react before your race is ruined. But I love this track – it’s my kind of track. The grandson of Richard Childress drives a black No. 3 truck, which Dillon says means a lot to him – particularly at BMS where the late Dale Earnhardt’s No. 3 won nine Sprint Cup races. Busch has five Camping World Truck Series wins to his credit this season while Harvick has two. Busch also has won the last three Truck Series races at the World’s Fastest Half-Mile. Dillon enters the O’Reilly Auto Parts 200 third in the Camping World Truck points, only 8 behind leader Johnny Sauter and five points in arrears to second-place James Buescher. The O’Reilly Auto Parts 200 is the second half of Wednesday night’s doubleheader, which begins at 8 p.m. The UNOH Perfect Storm 150 Whelen Modified Series opens the evening at 6 p.m. Tickets for the doubleheader are $25 in advance of the race and $30 on race night. Parents also can take advantage of reduced ticket prices for children as kids 12 and under can watch the Food City 250 for only $10 while children in that age bracket will be admitted free to the Wednesday night doubleheader. Fans can enjoy Saturday’s IRWIN Tools Night Race and Friday’s Food City 250 for as little as $99. Single-event tickets for the IRWIN Tools Night Race start at $90 while ticket prices for the Food City 250 begin at $45.